Axial spray transfer is one of the three primary methods of metal transfer in MIG welding. Axial spray methods deposit wire electrodes as a stream of small molten droplets. The droplets are sprayed along the axis of the arc. Works well on many of the most common metals and alloys including aluminum, carbon steel, stainless steel, nickel alloys, and copper alloys. Efficient processing of electrodes reduces waste; as high as 98% efficiency. Consistency and control of spray reduces spatter and slag. Suitable for thick metals in the flat and horizontal position. Axial spray transfer is most often used with shielding gases that contain a high percentage of Argon – as much as 80%; Argon-Oxygen and Argon-Carbon Dioxide blends are the most commonly used. Axial spray transfer is a high voltage method of metal transfer. The wire feed speed is also quite high, but the operator retains control over the spray by using apertures that are smaller than the diameter of the wire electrode. Speed is so high that several hundred droplets can be placed each second. This creates a large weld puddle, which is why the method is preferred for use on flat and horizontal surfaces. The high speed and rate of transfer makes axial spray ideal for projects that need a high deposition rate. Solid or metal-core electrodes are used with this method of transfer. Argon shielding gas blends cost more than pure CO2 gases. High heat radiation and a very bright arc require additional protective gear for welders and observers. Axial spray transfer remains an extremely popular form of welding. If you are having trouble with it, remember that every manufacturer uses a different type of arc stabilizer in the construction of their electrodes. You may need to try out several different brands in order to find the one that works best for you. 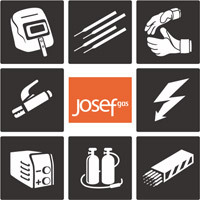 Shop for welding electrodes, gases, and suppliers at Josef Gas. We carry all the major brands like Miller, Lincoln, 3M, and more. Visit us online at www.josefgases.com or in person at 201 Basaltic Road in Concord, Ontario. Just have a quick question? Call our team at 416.658.1212. We’re always happy to hear from our customers and help them troubleshoot their welding problems!